Farewell to spring formerly at Russian Ridge, that used to grow where weeds took over. This is the tale of two agencies, which need to acquire successful weed management and/or Ecological Restoration technologies, for projects with hard deadlines. The first agency the California Department of Transportation (Caltrans) set the deadline of 2012 for lowering State-wide, roadside herbicide use by 80%; and two counties, Humboldt and Santa Cruz, are already at zero herbicide use now. The second agency, Midpeninsula Regional Open Space District (Mid-Pen) manages about 50,000 public acres in the Santa Cruz Mountains. On the Mid-pen preserves, the native grass, native herbaceous perennial and native annual understory in forested areas was 99% catastrophically removed by grazing 100-200 years ago, and the perennial grasses in sunny locations 90-95% removed, and the wildflowers 70% removed. The original native plant understory is either absent or is covered with European exotics, and either condition allows for the colonization of new invasive plant invaders into the already weakened ecosystems. Some of the invaders like False Brome, has the potential of covering most of Mid-Pen's forested acres eventually, plus Harding grass and Yellow star thistle are starting to form solid stands in all of Mid-Pen's open grassland preserves. Other new invaders are on the horizon, becoming major problems in the Mid-pen Preserves: Rattlesnake grass (originally confined to the Monterey area, moving rapidly northward), Dog's Tail grass (in 1960, only found in two locations in Santa Cruz County, now, is so common in Mid-pen preserves, that a photo of it is shown on Mid-pen's Skyline Preserve web page), annual Brachypodium (already solid in areas of Redwood City's Edgewood preserve), and common pasture grasses like the new aggressive selections of polyploid annual ryegrass and perennial ryegrass. --- Dog's tail grass, an exotic European weed grass, once rare forty years ago, is now so common that it is featured on Mid-pen's web site as a plant found on their preserve. (Skyline Preserve's web page, 2006). Some successful method of managing these weeds must be invented immediately, and fortunately, Mid-pen. has made a commitment to invest at least a million dollars to manage the False Brome. But will that be enough money, soon enough? You can see from the map of the False Brome, that the infestation is spreading rapidly. Which of the possible avenues will these agencies take to get the successful technologies they need? HARDING GRASS is a relatively new perennial exotic, an example of a fast-moving invader that has spread as solid stands, to cover Mid-Pen's land at Russian Ridge north end, in the last few decades. The plant acts like "land-cancer" replacing the native ecosystem with a monoculture of dense perennial weeds. Below: The Harding Grass on Russian Ridge from Google Earth, looks like a yellow cancer (37 deg. 19' 35.64"N, 122 deg. 12' 44.38"W). In this area, Harding grass was originally only found along the coast, 20 miles to the west, in 1972. Since then it has spread at the rate of about 1/2 mile per year westward. The plant contains DMT, a psychedelic chemical that protects it from being eaten by native herbivores. Photograph of Photograph Russian Ridge, with Stanford lands in the distance, where this weed is moving towards. WILD OATS, another "land-cancer" has been a major weed problem in California for over 100 years, and Mid-Pen lands and Caltrans roadsides are commonly infested by this annual weed, sometimes growing solidly like the photograph above, where 99% of the native plants cannot survive underneath it. Photo Russian Ridge, Mid-pen lands July 2003, eight months after the area was burned in October 2002. ...in 2006, and then in 2010, here's about how much is left...and someone needs to start breaking out the life rafts yet to save them! MID-PEN lands, at least on Russian Ridge, still have some isolated pockets of native grasses and wildflowers that could be managed so they would spread to cover larger areas. Measurements in 2003, after the October 2002 burn found an average of 13% native perennial grass cover of five different species, plus a 25% cover of wildflowers consisting of eleven species, and 2% cover of native shrubs. The worst cases at Russian Ridge were the Nassella pulchra (Stipa) cover went to zero in 2006, from a 2.3% cover in 2003, and has slowly recovered in 2013 to 0.4% cover, which means that it will take at least 15 years to recover to the 2003 cover level. The Melica cover also dropped in 2006 to zero, from 0.2% cover in 2003., one plant was found in 2012, but is extinct in 2013. Sitanion or Squirreltail grass, the most common native grass at 7.9% cover in 2003, is balanced on the edge of extinction, at only 1.2% cover in 2006. Sitanion in 2012 was only 0.3% cover and in 2013 is still at only 1% cover. We are watching the slow-motion extinction of an entire ecosystem, which is accelerated every time Russian Ridge is burned. Overall, the total native grass cover dropped from 13.5% in 2003, 4.7% in 2006, 3% by 2009, and only 0.5% cover in 2010, to a dismal 0.1% cover of only one long-lived species. By 2012 the grasses had recovered to 7.8% and by 2013, recorded 9.2% cover. 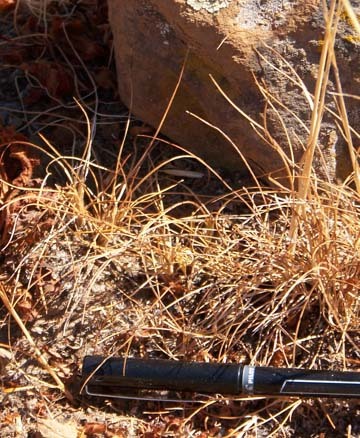 WHY IS A DROP IN PERENNIAL NATIVE GRASSES IMPORTANT? Those grasses are part of every California native ecosystem, and are useful as indicator species, measuring the overall health of an ecosystem. The first to get killed in a native grassland and wildflower field are the perennial grasses and some of the perennial wildflowers like Grindelia, California poppies, Coyote mint, Mule's Ears, Shooting Stars, Calochortus and Brodiaea lilies. Then in the later stages, the annual wildflowers disappear, like the Indian paintbrush, owls' clover, miner's lettuce, the native clovers, and the annual lupines. Whenever any exotic grass is allowed to invade a natural area, there's going to be death and destruction. Harding grass, ripgut grass and wild oats are two common examples. At Edgewood Preserve, the Brachypodium grass and perennial ryegrass are killing the natives, and on San Bruno Mountain, the Rattlesnake grass have destroyed native grasslands. For those interested in the science behind the natural herbicides in the exotic grasses, the Journal of Chemical Ecology (in the Stanford's Biology library, for example), and Dr. Liu's work on barley in 1994 and 1995 pioneered the concept, and invented a method to measure the effects. HARDING GRASS, the nasty perennial weed that kills 99% of the native grassland species, one of the strongest forms of "land-cancer", increased within the Russian Ridge area from a 2003 cover of only 0.5%, to 7.4% cover in 2006--an amazing five-fold increase in spread every year for the past three years. There has been some spotty management on the north end of Russian Ridge in the last few years, but in 2012 it was 0.8% cover, and in 2013, is back to 5.6% cover in the transect area, which follows the five-fold rule per year in the spread of that weed. Here's how nine Mid-Pen Preserve grasslands compare in August, 2006: From 250 ft. linear toe-point transects; except for Russian Ridge, measured along a 1,600 ft. toe-point transect. Russian Ridge, by July 2009, has experienced more than a 2,000 % increase in Yellow star thistle cover, at 14.5%, and the wildflower cover is down to only 33%. By 2013 after two spring droughts in 2012 and 2013, the wildflower cover was down to 26% cover, and the yellow star thistle was also down to 1.4%. NATIVE GRASSLANDS GOING EXTINCT at Mid-pen Preserves. Native grasslands are essentially extinct at four of the nine Mid-Pen preserves-Fremont Older, Long Ridge, Rancho San Antonio and Windy Hill in 2006--whereas only one preserve has native grasses above 10% cover. Even Foothills Preserve, with the highest native grass cover of the nine preserves, still has three exotics--star thistle and rattlesnake grass--invading on its edge, and nobody is managing those infestations yet. When any native plant resource ends up at only 2 to 10% cover, like the native grasses at nearly all of these preserves, it is very difficult to measure, or even be aware of the continued downward slide towards extinction. It's like having a very slow leak in a tire, you don't notice it until it's flat---and as an ecosystem gets closer to flat-lining, the more difficult it can become to save it. The trend for the northern portion of the Russian Ridge Preserve and its native grass cover, looks like this. Figures are estimates, except for 2003, 2006, 2007, 2009 and 2010 in brown, which were measured with a 800 foot long toe-point straight line transect across the top of the northern ridge. The illegal CAL FIRE burns in October 2002 and July 2007, did not bring the percent cover of the native grasses up to the normal 50% or more that is needed for a self-sustaining native grassland ecosystem. The truly amazing thing about exotic plants invading the California native grasslands, is that the exotics eventually sterilize the area. Once the native grass and native wildflower cover drops below a certain "tipping point", the area become unsuitable habitat for other life-forms and is essentially sterilized . Butterflies are usually the first casualties when exotic plants invade California native grasses. Walking through Russian Ridge Preserve in 2006, is like "Silent Spring"-- only a few birds, no butterflies, no native harvester ants, and only a few grasshoppers along the roads, and bumblebees restricted to the new acres of yellow star thistle flowers. Edgewood Preserve in Redwood City, the extinction has occurred of the Listed Endangered Bay Checkerspot butterfly, only a few miles NE of Russian Ridge. This butterfly depends on California native grassland habitat, when exotic-grasses like ryegrass and Brachypodium infested the preserve in the 1980s and 1990s, killing off its food and nectar plants. The California native grassland ecosystems is collapsing at both preserves. Across the entire State of California, it would be important for land managers to measure, to see if all of the relic stands of native grasslands are currently under attack, by new exotics that have invaded in the last 20-30 years, like at Russian Ridge and Edgewood Preserve. YELLOW STAR THISTLE, the prickly European weed in 2003 is moving onto Mid-Pen lands. This 2003 photo shows the infestation that got started in the mowed trail side, had only moved about 12 feet off the trail that year. By summer 2006, the yellow star thistle along the trail at Russian Ridge, had moved another 220 feet downwind, or an average of over 70 feet a years. The Mid-pen infestation is less than 30 years old, but this biennial weed has been a major problem in the Central valley for at least 50-60 years. PURPLE NEEDLEGRASS or Stipa (Nassella pulchra), a low-growing perennial native that used to be one of California's most common grasses, could be a perfect solution to both Mid-Pen's and Caltrans' weed problems. Photo July, 2003, of one of the last stands, along a Russian Ridge trail edge. Height about eight inches, and still green into the summer. Some of the native California bunchgrasses are low growing, only about a foot tall, and stay green late into summer, and grasses like the Purple Needlegrass, produce the lowest amount of flammable dry thatch per acre. Unfortunately, this resource is missing from 99% of Caltrans right-of-ways, and less than 1% Purple Needlegrass cover, still exists on Mid-Pen lands. Neither agency had established any program to manage, conserve, or restore this species, considering that these natives will be an extremely valuable restoration resource for the future. Also, Mid-Pen's five-year 2003 Strategic Plan mistakenly placed invasive weeds in almost last place priority, in third place, originally on the web at http://www.openspace.org/plans_projects/resource_policies.asp . FAREWELL TO SPRING and OWL'S CLOVER were very common low-growing native wildflower on Mid-pen and Caltrans lands at one time, and could become common again, once the exotic plants are successfully managed. Photograph Russian Ridge 2003. Same site, May 2008, the weeds back in full force, after the current burn. This is another attempt by the District to burn the exact same area to manage the weeds. Another illegal burn was October 2002, 65 acres, northern area of Russian Ridge, conducted by Jerry Hull of Ambient Control Systems (Photo above :Illegal Cal Fire burn July 26, 2007 of the northern portion of the Russian Ridge Preserve, 120 acres). THE EFFECTS OF FIRE are cheap and dramatic, but in the long term, and by itself, does very little to increase the percentage cover of the native bunchgrass plants, that are the keystone species of your "native grassland ecosystem" that you are supposedly managing. Fire opens ground and increases the broadleaf weed population in the short term, and the exotic wild oats and other weed grasses have the ability to take advantage of the vacancies created by fires, faster than most natives can. The existing broadleaf weeds and new weeds can take advantage of the bare soil created by the fire, like wild lettuce, milk thistle, Italian thistle and yellow star thistle. Unfortunately, District managers did not conducted any detailed vegetation transects on Russian Ridge, prior to any of the illegal fires, nor is there any detailed vegetation cover data for any years after each fire. Without any scientific measurements, the actual effects of either of the controlled burns were on this native grassland ecosystem, is unknown to the agency that is supposed to be managing this land for the public, and the public is not being given any information about these projects, which is illegal under CEQA. However, anyone viewing the results of the 2007 fire, as of May 25, 2008, can see that the Harding grass is resprouting vigorously, even after being burned and herbicide sprayed. The Harding grass have come back to life, like the Zombis in the classic horror movie, "The Night of the Living Dead"
The 2007 burned area also shows a huge drop in wildflowers cover, dropping by 35% by late May, because weeds like Italian thistle, yellow star thistle and wild oats, were able to occupy the vacancies in the grassland ecosystems created by the fire, faster than the natives could. When you walk through the regrown burned area, you hear the hiss and the death-rattle of the dying wild oats, grown like a four foot tall shroud, covering the native wildflowers and native bunchgrasses,. The wild oats dead stalks sounding like a million ghosts in the native prairie, strangling the life out of the native plants. There is no positive effect from the illegal fire, on the weed cover overall, and the 2007 fire actually increased the star thistle, Italian thistle, wild lettuce, milk thistle cover, when compared to previous years. WHAT'S ALL THAT GREEN? Yellow star thistle and Italian Thistle in the burned area, growing at the density of 100 seedlings per square foot (Photo May 2008). The one bright spot, is that there are still a few dozen plants of the Purple needlegrass seeds that were sown after the 2002 fire, and that stand is still growing strong, weed-free, which is what the 2001 consultant's report was recommending. The low growing native grasses, like Western fescue, Melica, Purple needlegrass and Sitanion grass seeds must be sown to take the place of the exotics. Burning a native prairie already infested with weeds, and not sowing in native seeds immediately thereafter, is like sanding off the paint off a car, down to the bare metal, and not immediately putting on a coat of primer--one should not be surprised if the car's bare metal rusts, or in the case of the native prairie, if the bare burned soil rapidly becomes more weed-infested. INSTEAD, seed should be sown on Russian Ridge, of local native grasses like the Western Fescue, which is very low growing and produces a minimum of flammable biomass in the summer. Western fescue produces only 134 pounds flammable biomass per acre (Photo September 2008). The original native cover, had the flammable biomass in summer, equal to a single sheet of newspaper spread over the land; whereas the exotic grasses like wild oats, are equal to 350 gallons of gasoline per acre. See the flammable biomass web page. Up to 40 times as much flammable biomass per acre? The years of illegally burning Russian Ridge has paradoxically produced more weeds and less wildflowers, and increased the flammable summer biomass, from zero pounds per acre for species like California poppies, to 3,000-6,000 pounds per acre for the wild oats and Harding grass. When Harding grass invades, it adds on the land, as much as 40 times as much flammable biomass, compared to what existed previously when only wildflowers and native grasses grew. Photo shows a rock surrounded by the thatch of the annual grass weed, wild oats, and you can see that it is thick enough to kill native wildflower and bunchgrass seedlings trying to germinate. All that dried weed-grass thatch must be raked off the valuable wildflower and bunchgrass portions of the Preserve by January 31st every year, so that light can get to the wildflower seeds, and allow them to germinate. Russian Ridge wildflowers used to be the best non-serpentine example within a 250 mile radius of the Bay Area before the five illegal burn projects. The State considers wildflower fields to be our second most endangered plant community. So if a botanist was to conduct a toe-point, at least 800 foot long linear transect measuring the plant cover at each of your grassland preserves, that could be a very valuable record and management tool, and would only take about one hour a year at each of your preserves. Of course the Harding grass that forms a 2-3 foot thick blanket, kills all of the bunchgrasses, and keeping the wildflower seeds from germinating, and must be all cut each year from summer to fall, then spot herbicided, or dug out. Then each year, the seedlings that come up are treated until the soil seed bank of Harding grass seeds is depleted over time. The management staff should establish a ZERO TOLERANCE for Harding grass on any of the District's preserves. And here are the Italian thistle seedlings coming up today, at about one per square inch, or about 150 per square foot, or about 6.5 million per acre. The easiest way to deal with these thistles, it to buy baled Purple Needlegrass (that is the main native grass growing in the sun on your preserves) hay from Hedgerow farms, and cover the seedlings at this stage with a Needlegrass straw mulch, or use some other kind of plant mulch that does not contain any weed seeds. THIS IS WHAT YOU WANT, instead of the weeds. Purple needlegrass, along with Squirreltail and Melica grass are the main bunchgrasses that should be covering all of Russian Ridge and all of your other grassland preserves. Like the field underneath the bear on the California flag, this is the pattern that was on the land when our flag was designed in the 1850s, and 11 bunchgrass plants can be seen under the bear. Between each bunchgrass plant this time of year, all the other plants should be under 2 inches tall, with the tufts of bunchgrass about 6-8". The lack of thatch between the bunchgrasses, allows the wildflower seeds to get light to germinate and grow. January 2011 - RUSSIAN RIDGE UPDATE--All previous burns illegal under CEQA, and who will pay for the $20 million in damages? Another series of burns were approved on April 14 by the Mid-pen Board to burn three of the District's preserves, including Russian Ridge but by summer, CAL FIRE stopped the 2010 Russian Ridge burn on June 18th, "..due to CEQA legal issues," via an email from the Battalion Chief Mike Jarske. However, a closer look at the environmental documents over the past decades, reveals that none of the CEQA homework had been done, for the 2010 proposed burns, nor for any of the burns in 1998, 1999, 2002, 2007 or 2009, plus no adequate vegetation cover monitoring or burn environmental impact analyses been done for 1996, 1997, 1998, 1999, 2000, 2001, 2002, 2003, 2004, 2006, 2006, 2007 or 2008 to see if the burns had been effective or damaging. In fact, the Board passed a Resolution No. 01-29 in 2001, giving themselves a Categorical Exemption in part (iv), of never having to ever write an EIR when doing "Maintenance of existing native vegetation" of all the tens of thousands of acres of our public native plant resources. The whole purpose of CEQA, is that it requires a public agency to write an EIR if their project is going to have an effect on existing native vegetation. So by passing such a resolution, this is like a taxi company thinking that they can exempt themselves from the entire vehicle code section of the law. Now the question is, who is legally liable to pay for the fire mitigation damages, to bring the endangered native grassland and wildflower habitat, back to a pre-burn cover? The District or the outside agencies and consultants that conducted the burns, or both? When complying with the legal requirement of mitigating the damages, and restoring the previously burned preserves back to their pre-burn wildflower and native grass cover levels, the managers will finally have the opportunity to invent the ecological restoration and weed management technologies necessary, to control the weeds and restore the wildflowers effectively. Letter requesting that the Board to do the right thing, and get street-legal with CEQA and their land management practices. so you can go out and compare and see how far the weeds have been spread over the last 13 years by the illegal fires. May 2011 Update, native grasses extinct and 20% Italian Thistle cover. My letter to CAL FIRE last year was able to stop the 2010 burn at Russian Ridge, so fortunately, the wildflowers have had five years from the last illegal burn to begin their slow recovery from the fire damages, and the populations are starting to rise. By checking the map of the 1996 weed locations, and walking down the north end of Russian Ridge, you can see how a plant that a formerly rare weed like the Italian thistle, that only occurred as a roadside and path-side weed in 1996, by the mis-use of fires, can spread to cover 20% of the area in 2011, after only a couple of fires. No CEQA consultation with DFG? I have not found any evidence of Mid-pen. or CAL FIRE ever having any CEQA consultation with the State Department of Fish and Game, regarding these five illegal fire projects, and have sent a note to Sacramento about that issue. Furthermore, a herbicide spray program has begun in the wildflower fields at Russian Ridge, again with no EIR, no draft project presented to the public for comment, no alternatives presented, no mapping of the wildflower fields so they are not accidentally sprayed, no before and after monitoring being done, no CEQA thresholds of significance being established, etc. Read about these CEQA issues, in a letter sent in May 2011. SOLID HARDING GRASS weeds on the cover of the spring 2011 Mid-pen. newsletter. Is this District completely unaware of their surroundings? Shows two children and their mother hip-deep in solid exotic Harding grass. Why would you show a picture of one of your worst-managed, weed-choked preserves on the cover of your newsletter, unless you were completely unaware that the picture shows that you do not care about weed management or the environmental resources on your preserves? "Mommy, mommy, toss me a machete so I can get the heck out of here!" and wildflowers around me, and it's starting to eat me too!" "Mommy, mommy, I'm seeing funny colors from the DMT in this Harding grass, and you are starting to look like Lucy in the Skies with Diamonds!" The exotic weeds that were measurably helped and spread by the five illegal fires, were 808,000 Italian thistle plants, 527,622 Harding grass plants, 152,000 yellow star thistles plants, and 2 million wild oats plants, for example. Those were the taller weeds that spread, plus uncounted shorter annual grass weeds and exotic clovers, also spread and took advantage of the damage to the wildflower fields and native grasslands by the fires. The fire-killed environmental resources that existed before the fires and need to be restored, include 200,000 Sitanion grass plants, 156,000 Nassella pulchra plants that were lost in the fires, 32,000 Melica grasses, 20,000 Festuca grasses, 20,000 Koeleria grasses, 500,000 annual tarweeds, 500,000 owls clover plants, 400,000 Layia wildflowers, 224,000 White Yarrow plants, 160,000 Amsinckia plants, 52,000 lupines, 40,000 native Plantago, 40,000 miners lettuce, 40,000 coyote mint plants, 40,000 California poppy plants, 40,000 blue eyed grasses, 12,000 popcorn flowers, 12,000 buttercups, and 10,000 Farewell to Springs. Original Titanic photo from http://www.kinoweb.de/film98/Titanic/ and Mid-Pen preserves map modified from a map on Mid-pen's web pages at http://www.openspace.org. Acknowledgements: Many thanks to Deane Little, a former Mid-pen Board member, and for Bill Korbholz's (Friends of Edgewood) Powerpoint presentation of the Edgewood Preserve's disappearing native grasslands and wildflowers, shown at the July 18, 2006 San Mateo County Weed Management Area meeting. Literature cited: Kephart, Paul. 2001. "Resource Management Demonstration at Russian Ridge Preserve, Annual Report 2000. Final Report," Rana Creek Habitat Restoration, Carmel Valley. 19 pages., available from the Mid-pen. District office in Los Altos, California. 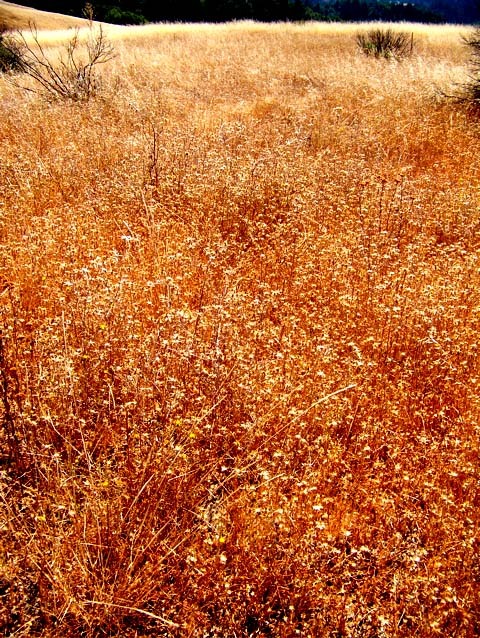 Is time is running out for our California native grasslands on public lands?? ?